John Bell Pipeline Equipment Co. Ltd stock the full range of Teekay Mechanical and Flexible Couplings. We stock the full range of Teekay mechanical, flexible and fireproof couplings. Teekay couplings are used extensively for the installation of new pipelines and for the repair and maintenance of existing piping systems. They are suitable for joining most types of plain ended pipes between 20mm and 4200mm in diameter and are widely used within the Oil, petrochemical, water, construction, power, process and ship building industries. Teekay products successfully combine strength with flexibility. Strong and robust they are capable of working pressures upto 25 Bar, are light in weight and easy to install. Available from JBP stock or on quick leadtimes from the factory. 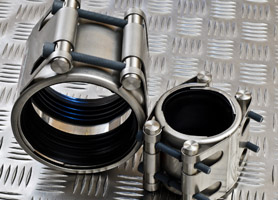 Teekay couplings offer the pipeline designer, installer and operator significant commercial benefits as well as positive technical advantages. These couplings save space, weight, time and cost.